She’s actually spot on. This book is totally interesting. To start, Jones chronicles three iconic church builds in twentieth century America — the United Methodist Building in Washington, D.C., the Interchurch Center on New York City’s Upper West Side, and the Crystal Cathedral in Garden Grove, California (established in 1924, 1958 and 1980 respectfully). Jones raises the theological, religious, and cultural climates that enabled these churches to prominently rise on the Protestant scene during their respective decades. Jones also shares how each church’s initial mission or charter has either died or has radically changed after each faith-based organization flopped. Wait. What? They failed? How’d this happen? So, what went wrong? Did God look away? Did people not pray hard enough? The answers to these questions are varied and complicated, and Jones walks into the reasons these mega structures took mega dives, but here’s a message for all of us: God is still God. God still does what God has done, He endlessly finds ways for us to experience and share Him with His new and fresh mercies every day (Lamentations 3:22-24). I don’t think God sets a church up to die, but I do think He energizes the right people at the right time to carry His new and bold visions and plans into the present and future. Name a church that hasn’t had a personnel issue. Did a Christian Education director get canned? Did an associate pastor pack and move into obscurity in a matter of weeks? Churches do struggle. No religious institution has had a problem-free, everything-is-blissful life. Churches also stray, even fail. But our resourceful, resilient God didn’t keep Jesus in death; He certainly won’t keep His message of salvation through His Son dead, either. He works, and this is where you’ll see it. God has not and will not make it “easy” for the Christian; that’s not on our membership card; but with Him we aren’t thwarted. 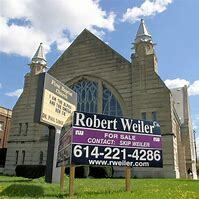 We will tell the next generation the praiseworthy deeds of the LORD — even if we do it on the steps of a defunct church that has a BUILDING FOR SALE sign planted on its front lawn. This blog first appeared in Susquehanna County’s The Independent on May 9, 2018. « It’s all right here.